The solution to organize paper clutter in your home. This tip is simple and will help you clear the clutter. 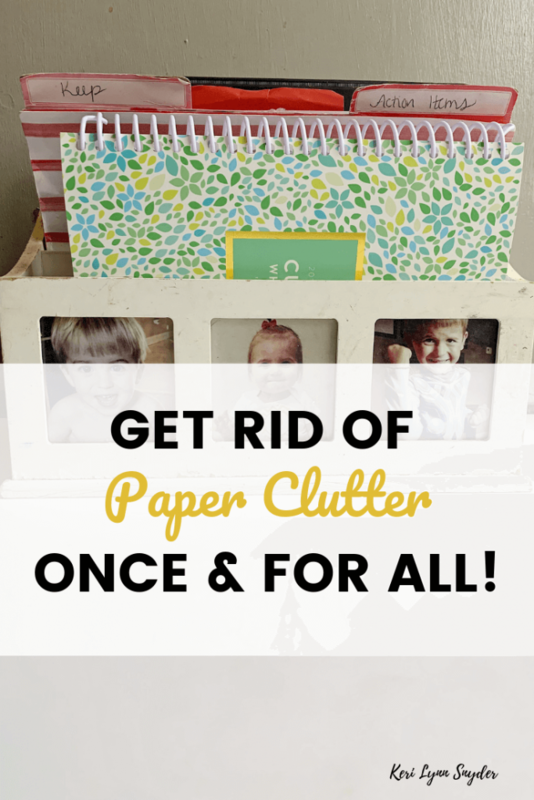 Ready to organize paper clutter? The kitchen is often a magnet for paper clutter. We drop the mail, school papers, bills, receipts, etc all into one chaotic pile on the kitchen counter. As the pile grows, the less likely we are to tackle it because it seems so overwhelming. The trick to organize paper clutter is to learn to stop the clutter from hitting the counter. We have to beat the problem at the source. Which is how I have come to use this simple method to organize paper clutter. This week we are focusing on the office, garage, and basement. We actually do not have any of these spaces, so I decided to focus on how to organize the papers in the kitchen. We are in week five of the Clear the Clutter Challenge. In week one, we talked about how to declutter the kitchen, week two we focused on the living room, week four we focused on the master bedroom and bathrooms and last week we focused on organizing your child’s space (I shared how to organize Barbies). How to Organize Paper Clutter! Decide a landing place for your papers. There are going to be receipts you need to keep, forms to hold on to, and so on. So decide where they will go. HAving one landing place keeps things contained. Open the mail right away. 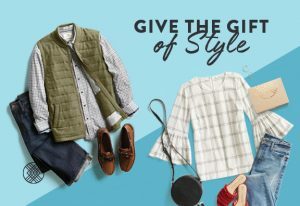 Instead of letting the mail accumulate, open it immediately and take action on it. Recycle, trash, file. This will help eliminate clutter. 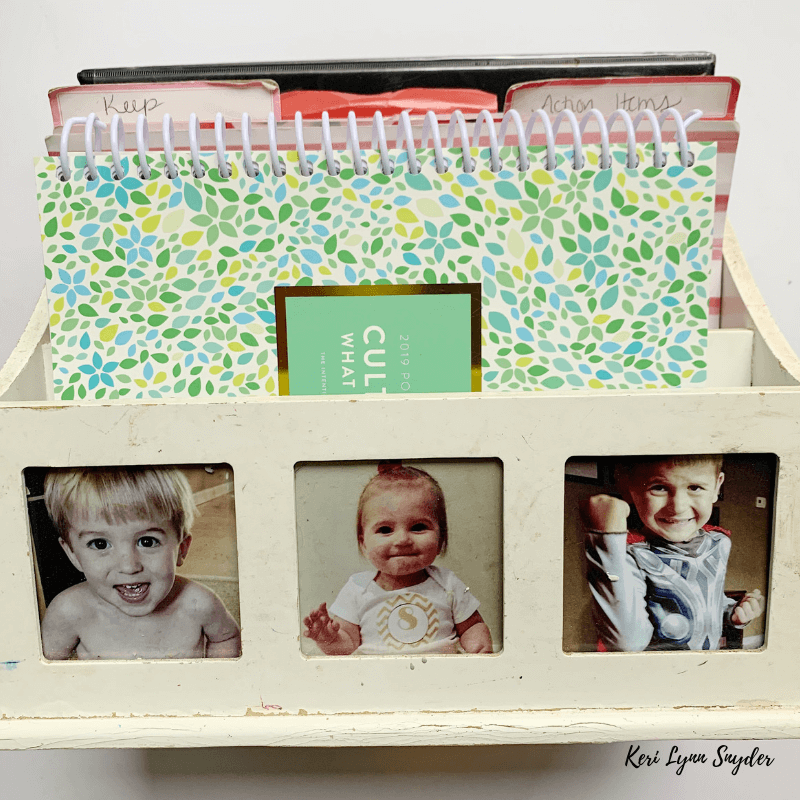 Use a desk organizer and files. A few years ago, I found a simple while desk organizer at a second hand store. 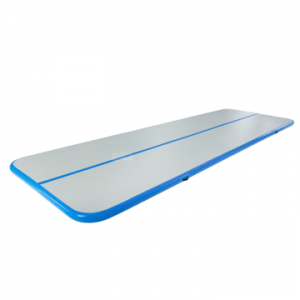 It has three slots that are perfect for file folders. Action: This folder holds anything that needs to be filed or dealt with. Bills: This folder holds all of our bills that need to be paid. To Keep: This folder holds anything that I need to save. The goal is to go through the action file folder once a week. That is it! Beyond the desk organizer, I have a file box that holds paid bills and important documents and I have boxes for my kids’ art work. What about you? Any tips for how to organize paper clutter? You can sign up to receive the free printable decluttering calendar below. If you are new, look over the challenge details. 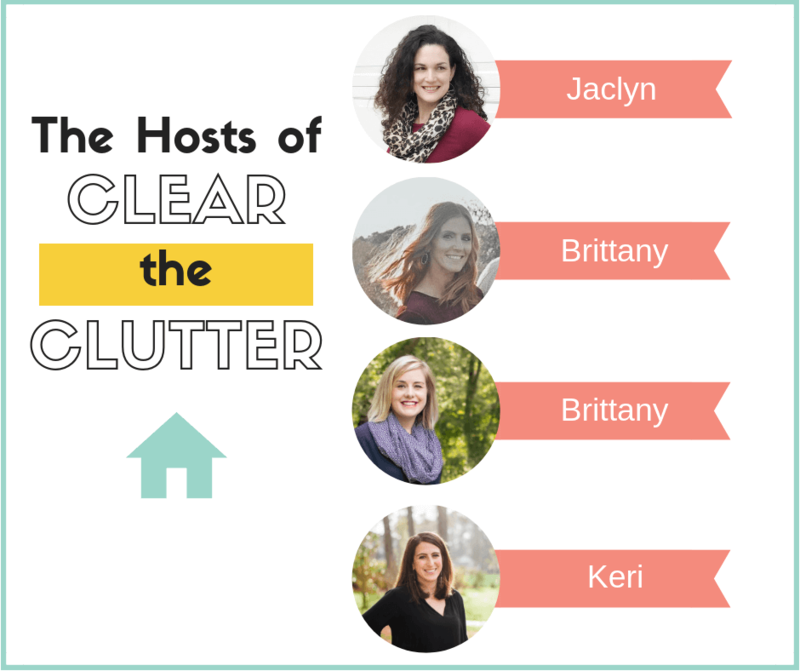 Join our Clear the Clutter Facebook Group to share your progress, struggles, or questions! Hop over to read these great posts as well! Jaclyn lives just outside of Cleveland, Ohio. She is a mom of three + married to her college sweetheart. She blogs about family activities and traditions, home decor, and favorite finds at Coffee, Pancakes, and Dreams. Brittany is the face of Dreams + Coffee, a lifestyle blog focused on family, fitness, healthy living and style. She has a passion for staying fit, eating healthy, pretending to know a thing or two about fashion, and most importantly, spending quality time with her husband and daughters. She is thrilled to be living out her passion for writing and editing through the blog as well as through her freelance writing career. 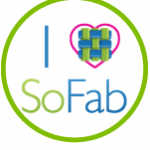 Brittany is passionate about helping everyday women create extraordinary homes the easy way! As a busy working mom, she understands that when possible, getting something done is better than making it perfect. She & her family live in Ann Arbor, Michigan in a home they built 5 years ago. Brittany writes at Our Home Made Easy where you’ll find quick dinner recipes, easy DIY projects, and home decor inspiration that anyone can create!